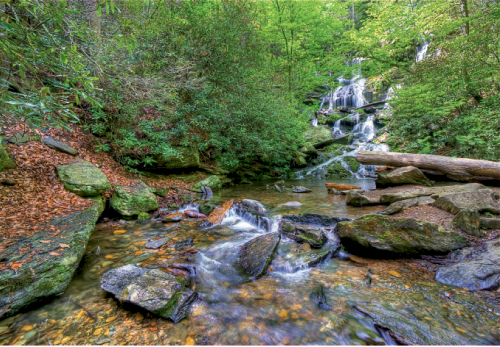 Waterfall lovers now have unlimited access to the stunning headwaters of the Catawba River, located in McDowell County. Thanks to efforts by the Foothills Conservancy, a few years ago, Pisgah National Forest acquired 88 acres that provide entry to this lovely cascade. From the trailhead, follow a wide path that crosses the Catawba River. There is no bridge, so take care crossing when the water is high. Continue along the footpath, ascending occasionally as you enter a gorge. At 0.8 mile, cross Clover Patch Branch above a chute of whitewater passing through granite boulders. Just past that, take care to stay on the trail where the Catawba River and Chestnut Branch meet at the base of a steep ridge covered in hardwoods. The trail bears left along the river to reach the lower Catawba Falls. A steep and eroded passage with a hand line continues along the right side of the falls. Be mindful: The consequences of a misstep are extreme. Retrace the route for a 2.5-mile round-trip.